Glutamine or L-Glutamine accounts for more than 60% of all the free amino acids in muscle cells. It is directly related to protein synthesis, the immune system and regulates ammonium levels that can be toxic to the body’s cells. 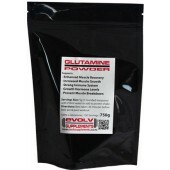 During intense training the body’s demand on glutamine can increase dramatically. The body’s organs will require additional glutamine and the muscles will replenish these stores into the blood. Also lactic acid, ammonium build up and catabolic hormones also require more glutamine which deplete the muscle tissue even more. Pre-training & during training to help increase the body's glutamine stores which reduces muscle depletion during your workout. Post training & before bed to support faster recovery.